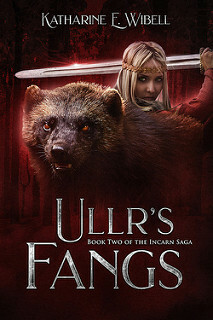 This is my stop during the blog tour for Ullr’s Fangs by Katharine E. Wibell. 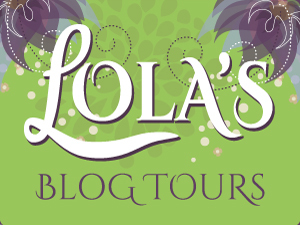 This blog tour is organized by Lola's Blog Tours. The blog tour runs from 25 June till 15 July. See the tour schedule here. Without moving, Lluava stared out at the stars and felt the cool touch of the breeze on her skin. “Lluava.” The tenderness in Varren’s voice was something that she had been longing to hear. A smile slipped past her lips as he gently placed his hand upon her shoulder. Then her anger seared up. Jerking her body away, she snarled, “No. I’m only your partner.” As soon as she said the words, Lluava regretted it. She never wanted to be the cause of the hurt that was written on Varren’s face. Lluava made no move to respond. She watched as the loose curls fell back into place over his forehead. “Will that happen tomorrow? At court?” Lluava questioned hopefully. “I fear not. This is a delicate manner. No betrothal has ever been revoked. I will not allow Illia’s reputation to be marred by this act. Though both she and I want to be allowed to follow our hearts as common people can, I must deal with the High Council as well as my grandfather. This decision will have repercussions. The whole culture of our matchmaking will change. I have to approach the situation with care.” Varren implored her to understand. Lluava had not considered the implications. The situation was completely unfair. He was the prince. Why couldn’t he just say he was through and that be it? Why was it so complicated? To hide her disappointment and her longing, she walked out onto the balcony. Pretending interest in the glowing city below, she concentrated on steadying her breath. When her eyes teared up, she clenched her jaw. Why was she being so foolish? She was seventeen, old enough to act with a level head. Besides, Varren had said he would be with her. She just had to wait. Yet patience was not an attribute for which she was known. Soft footsteps approached behind her. Lluava’s heart picked up its pace. She felt herself tense and focused her attention on a distant lantern on one of the buildings. She felt Varren’s presence before his touch. Strong arms wrapped themselves around her, pulling her body close. Lluava willed him to hold her tighter. She could feel his heartbeat against her back, the warmth from his skin, his soft breath on her neck. They stood for a time, Lluava afraid to move and end the moment. Turning her head, she looked at Varren, to memorize every detail softly illuminated by the moon. Dark hair framed his strong yet gentle face; kind blue eyes sparkled like the stars above; her eyes traced his perfectly shaped nose and softly smiling lips. Lips that parted slightly and slowly moved toward her. Stopping so close that Lluava heard the catch in his breath. Leaning upward, their lips met, fitting perfectly with one another. A warm, tingling sensation coursed through both with their touch. It was so simple, so wonderful. When they parted, Lluava felt as if she were in a dream. There was something surreal about standing so close to this man, her prince, her partner, her…. “Lluava.” Varren breathed her name as if he, too, were testing the reality of having her before him. She looked into eyes that were filled with unspoken emotion. Finding no words, she waited until Varren could continue. Smiling at each other, they leaned in once more. There was a sharp knock on the door. The mood was shattered. Varren quickly stepped back from Lluava, yet his hand lingered long enough in hers to convey his disappointment. She watched the formal expression slip back over Varren’s face. Until he nullified his betrothal, this was the last time she would experience his embrace. Lluava could not help but loathe the steward’s interruption. 1) Do your characters seem to hijack the story or do you feel like you have the reins of the story? Working on the Issaura’s Claws, the first book of The Incarn Saga, I had a very good idea about who my main characters were, the basic plot and the ending. Yet, shortly after beginning to write the story, a character took shape with a personality so strong that I knew he would return later on. Byron essentially wrote himself into a main role. I know there must be some skeptics that cannot fathom the idea that characters can write their own stories. But for me, this has happened more than once. As I wrote the initial drafts of the four books that comprise the series, t multiple instances have occurred where characters arose from nothing, subplots revealed themselves, and my ideas on how the story should progress veered off into something quite new and unexpected. I have come to realize that once a story or epic is born, my purpose as the author is to serve as a biographer for the characters I have come to know and love. They tell me their stories and I write them down. 2) Convince us why you feel your book is a must read. 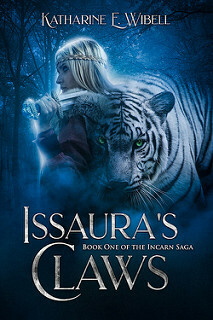 Ullr’s Fangs and its predecessor, Issaura’s Claws, are action-packed books that not only highly entertain fantasy lovers but also deal with topics that are applicable today. You will enter a world where humans exist alongside beings that can transform into animals. 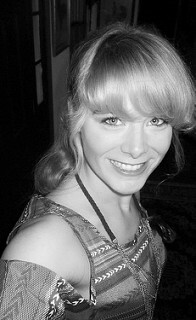 These stories follow Lluava Kargen as she is drafted into the military, trains as a soldier, and experiences war first hand. Readers can relate to not only coming of age issues faced by a seventeen-year-old girl and her friends but also open discussions about racism, religious persecution and sexism in society. Villains are not always whom you expect them to be, governments can be easily corrupted, war leaves lasting scars on everyone it touches and not all scars are physical. The world is never black and white. And throughout the pages of these novels a question echoes: does a higher power exist. 3) Have you written any other books that are not published? Yes. I have completed drafts of the third and fourth books of The Incarn Saga as well as the first book of my next Young Adult Fantasy series. Readers can keep an eye out for them in the coming years. 4) Pen or type writer or computer? I am a computer person. Computers allow me to jot down all my thoughts quicker than pen and ink as well as easily edit my work. However, I will admit that I make notes, sketches and diagrams on paper, napkins, sticky notes and other surfaces when inspiration hits. 5) Anything you would like to say to your readers and fans? As an author, writing the story is just the beginning. Next come revising, editing, formatting, proofreading, and marketing. Surprisingly, marketing requires a huge amount of time. If you enjoy an author’s work and want her or him to publish more in a shorter time span, you can help! Spread the word on social media and by word of mouth. Post reviews on Amazon, Goodreads and other websites. Believe me, I would much rather write a new book than spend time promoting the one I have just finished. So go ahead—pin, tweet, post, review, and like!